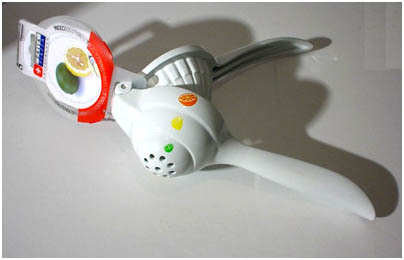 This triple citrus press / juicer – does as it says it does, limes, lemons and oranges. Not only does it look good – made of sturdy aluminum coated with a white epoxy coating – it worked amazing in our tests. We were pleasantly surprised to see that the rind was essentially dry when we were done squeezing tip: provided the item was sliced in half and placed in the device face down – there’s this strange tenancy to want to put the citrus face up – but resist the urge! The idea is, it turns the rind inside out by the time it’s done to get every last drop. We even zested some of the citrus prior to pressing, and it still worked brilliantly. It’s easier on the hands than we thought, which was a pleasant surprise. cleanup – perfect – goes in the dishwasher – which checks the box for us! size – compact, efficiency not compromised by size. It won’t do the larger oranges, but hey, A) those big ones usually don’t have as much juice and B) We’re happy it has the orange option – instead of having to have yet another device in the kitchen. For the price – at the time of purchase it was a bit of a gamble. Did we really want to spend the $20 on a brand we hadn’t heard of for yet another gadget? 2) it said Swiss on the label (Swiss known for quality products). So we made the purchase, and were very glad we did.